I’d like to first of all apologize to our readers for a bit of an absence, and leaving the site on hiatus. 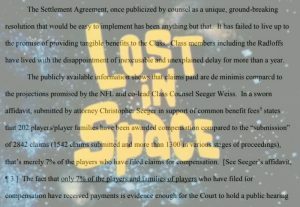 I’ve written an update on the NFL Concussion Settlement detailing a recently filed motion which has requested a hearing to address the claims delays. Hope you’ll check it out.